China is not a pioneer in developing and adopting new technologies, or more precisely, green technologies, until the past few years. Society pressure for improving the environment of living space has led to the releases of a variety of environment protection regulations, spanning from coal mining to automotive production. And more regulations are foreseeable to be released in the future, resulting into the speed-up of adoptions and commercialization of new and green technologies in China. So one interesting phenomenon is that although many new technologies are developed in large international companies’ R&D center in America or Europe, their industrialization in a large scale can only be seen in China or other countries in the Asia Pacific region. Compared with China, America does not see such a quick increase of regulations restricting VOC release from coatings and adhesives. And government officials and scientists are still debating whether the earth is getting warmer. American national standards for VOC limitation on coatings are lagging behind that of China and Europe. But certain states such as California implement their own regulations, which have strictier VOC limitations than at the national level. As a result of this difference between the world’s two largest economic countries, in some market segments the technology adoptions in America are lagging behind those in China. The environment protection regulations in China are pushing the coatings companies to speed up the adoption and industrialization of new coatings technologies including high solid, solvent-less and waterborne at a speed which has never seen in previous years. Yunnan province is China’s 17th provincial level region to impose fees on the disposal of VOC pollutants, following Beijing, Shanghai, Jiangsu, Anhui, Hunan, Sichuan, Tianjin, Liaoning, Zhejiang, Hebei, Shandong, Shanxi, Hainan, Hubei, Fujian and Jiangxi. And these regulations mainly affect the operations of those companies in the chemical, packaging, printing and solvent-based coatings industries. Not only green technologies are adopted faster but also some specialty products are industrialized more quickly in China. The motivations behind could be many. One reason is that production capacities of electronic devices are mainly in East Asia. This explains why some technologies and their related products, such as silicone adhesives and coatings and polyimide tapes, become popular in China first, and the current trend is that these products are flooding back to the American market. Norman M. Kanar, Americas Area market manager for Release Coatings and Pressure Sensitive Adhesives, Dow Corning Corporation, said in his report that Silicone PSA users in Asia will be significantly increasing the use of platinum curing PSAs. In the Americas and Europe, however, use of platinum curing PSA is projected to remain flat, while use of peroxide cure silicone PSAs continue to grow. BPO, a hazardous chemical, is widely used as the crosslinker in silicone PSA tapes’ production in America. But the extra investment for changing the coater could be significant, so without extra demand from the customers or the pressure of new regulations, most American companies do not want to produce platinum curing PSA. Besides, solvent-less coatings and UV curing technologies are widely explored in the production of printing, furniture and plastic products. 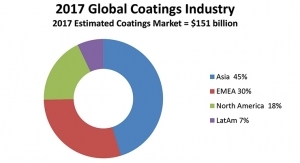 With overcapacity getting worse and with the price of raw materials continuously rising up, the coatings market is evolving quickly. Many small and medium sized coatings companies are closing their factories or retreating from the market. Only the coatings companies who can differentiate themselves and position themselves accurately in a niche market can survive. On the contrary, large coatings companies are still expanding their footsteps in China. For example, SKSHU is in the process of listing their stock in the market. In the first half of 2016, the company’s revenue was increased by 27 percent over the same period of last year. In addition, the company is building a new coatings production base in Sichuan province. The concentration of production capacities in large coatings companies will put more small companies in the brink of bankruptcy. Focusing on winning a niche market is the only way out of this fierce competition for small coatings companies. Unlike manufacturing industries, service industries will still grow in China, and the prospect for environmental friendly coatings used by service industries are even better. Besides, although most manufacturing industries’ demand is shrinking, the automotive market in China is growing still fast. Based on the report released by China Association of Automobile Manufacturers, automotive sales in November grew by 10 percent compared with last year. With the number of total vehicles continuously increasing, the automotive service market will grow even faster in China. According to the report released by MARTEC during 2016 ChinaCoat, waterborne automotive refinish market in China will grow by over 20 percent from 2016 to 2020, although overall automotive refinish market’s growth will slow down. The report also disclosed that waterborne coatings have big growth potential in engineering machinery, fork truck and farm machinery market. Right now, waterborne coatings in this market segment only holds 1.2 percent share, and is mainly used as primers. Sika flooring and coatings business unit has increased their annual sales in China to 350 million yuan in 2016. The growth, representing every 100 million yuan sales growth in three years, comes from market share increase in the flooring market as well as winning of market shares in other architecture coatings and building materials. The success of Sika is originated from high customer satisfaction for Sika’s solution, which combines both high quality products and excellent customized services. The Chinese coatings market is changing quickly. And the situation could be even worse for coatings manufacturers if the trade relationship between the U.S. and China fluctuate in 2017 with the new government on board. Coatings companies need to adapt themselves quickly to the latest market trends and foster a service mindset instead of focusing simply on production like they did previously.